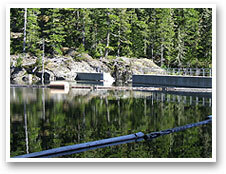 In December 2011, the Englishman River Water Service was provided with a grant from the federal government's Gas Tax Fund for $1.3 million for aquifer storage and recovery research and testing. Upon completion of construction of the water treatment and intake facilities in late 2018, the ERWS will revisit the concept of aquifer storage and recovery. ASR is not included in the construction of the water treatment, water intake and transmission mains. 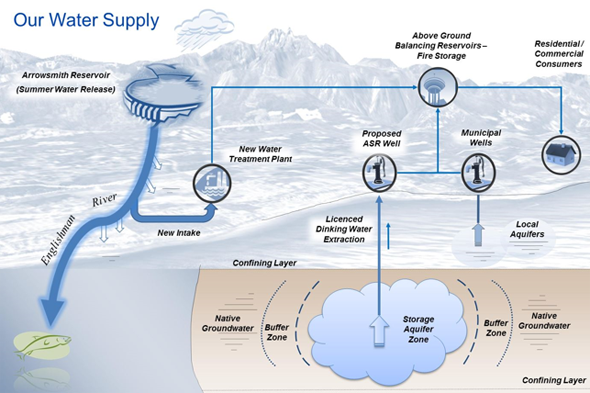 Aquifer storage and recovery (ASR) is defined as the storage of water in a suitable aquifer when water is available and recovery of the same water later on when it is needed. A typical schematic of an ASR well, used to both inject and withdraw water, is shown in this illustration. Incorporating ASR into the system would involve contributing water to the storage aquifer in the winter when excess supply is available and withdrawing this water in the summer when supply is most challenged to meet demands. ASR would create an additional supply for the ERWS which would provide more than one water source and allow the ERWS great flexibility in managing the water resources. This means less water will need to be drawn from the Englishman River during the summer when river water levels are at their yearly low. 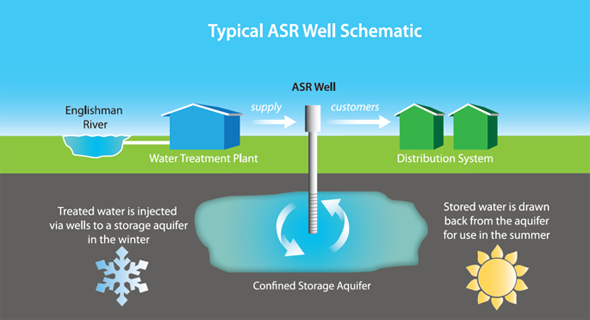 ASR requires an aquifer with specific characteristics such that the aquifer is able to protect and contain the stored water but also allow easy extraction. Of the 13 aquifer systems in the region, five were identified as potentially suitable. In order to determine feasibility, further investigation is required. There are some general uncertainties when considering ASR. One risk is that the storage aquifer may not be sufficiently confined to fully retain the stored water. Some losses are expected as water slowly migrates through the ground, but if the losses are significant the amount of stored water that can be recovered might be unacceptably low. A second risk is that water injected into the aquifer may pick up material that is in the ground, such as iron and manganese. This may lead to the stored water requiring additional treatment when the water is pulled back out of the aquifer. To assess these risks for the region, an extensive testing feasibility program is required to more accurately characterize the candidate sites and to simulate the ASR process. 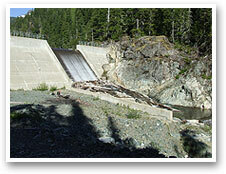 ASR is a small component of the overall project and budget and it has the potential to become a significant water management strategy which will help mitigate the impact of climate change and ensure minimum fisheries flows are maintained in the Englishman River during critical summer water demands when the flows are low. Once the water treatment plant and intake are constructed and fully commissioned we will be revaluating the feasibility of using ASR to reduce overall project costs and improve reliability. As a popular tourist destination, our demand increases significantly over the summer and becomes very challenging for the water system to react. During drought conditions ASR will help these seasonal water supply/demand peaks to be balanced while reducing the water extraction from the Englishman River. Copyright © - Arrowsmith Water Service .